The first was planted soon after the house was completed. We had been warned we wouldn’t see the brilliant red leaves, usual to the “ever red maple.” It sat too much in the shade. By October of its first year, the sun had shifted enough to please and it displayed all the red one could hope for. Only knee-high at first, it prospered to my great joy, ultimately reaching enough height it could be enjoyed from indoors as well. Our winters, however, were not kind to that little tree. It almost died repeatedly. “Trying” my notes say year after year, even once “top pretty much winter-killed but it’s reviving.” It had long claimed a soft spot in my optimistic brain as I kept checking — and hoping. Any sign of growth — top or bottom — was an occasion for celebration. Not — however — destined to be. The stump remains — just too big to easily be uprooted. I missed that tree so finally ordered another. The nurseryman who delivered and planted this one wouldn’t put it close to the old spot — too near the house. Ultimately we agreed on a site not too far away. Handsomely dressed in dark red leaves, this tree has to be nine feet tall. More or less. Hardly a baby bush! But this summer being terribly dry (and absolutely gorgeous) meant, I was told, the tree needed water often. “A bucket” would do. There seemed enough in-between rains that I didn’t water as often as I should have. Or perhaps the tree just felt it was in a spot too shady. It began to pout — lots. By then I was spending so much time tending to my new tree that I did begin to talk to it. (Heck! I’m told my house plants prosper with music and voice so why not?) Be assured — PLEASE — I have never talked to a tree before. Not since becoming an adult at least. All right then. If I’m going to be talking, it might as well have a name. “Mike.” I apologize to Mikes — and Michaels — in my history but that’s what this tree wanted to be called and it fit to a T: tall and lanky. Yes indeed, a Mike. Now Mike is getting plenty of water but he doesn’t seem particularly pleased. Oh, there are countless whirly-bird seeds ready to go but his handsome deep maroon leaves are curling and quite covered in brown blotches. By now I’m habituated to Mike. I stop every time I’m near, checking from indoors frequently as well. I’m not really sure why because nothing changes. Mike is as phlegmatic as they come. On reflection, I supposed the pessimist in me just wants to be sure he keeps his clothes on, tattered or not. On one of my watering forays, I was surprised to see that Mike had a secret, a little surprise he’d been keeping from me. Out watering not too long ago (it takes time to keep the flow near the tree, good times for conversation), up popped a toad from the very same hole the water was going down. Happily I was about done for I had no wish to annoy the little toad. I had hoped it was a peeper but my photographs say no. Most likely it’s . . . heck! I have no idea. Time to check with my authorities. I do, fortunately, have one superb photograph. 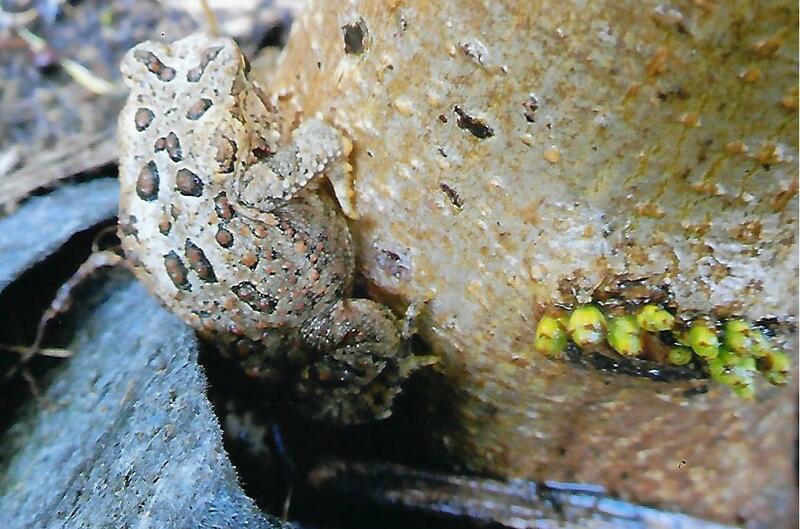 Thanks to the RTPI’s Twan Leenders I can happily report these are young American toads. See? There are all sorts of rewards to watering Mike. Best of course will be to see him rebound to share many healthy years with me. Not enough rain yet to matter. Let me go fill the bucket again. Yes, I’m looking for a very long-term relationship.